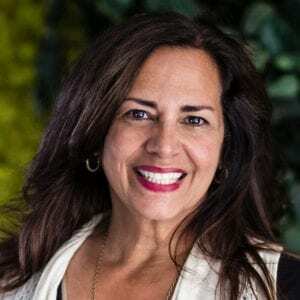 Kathy Caprino helps women discover their special talents and learn how they can use them to light up the world with the career of their dreams. Once a successful, but unhappy corporate vice president, Kathy had to have her own crisis and breakthrough to found Ellia Comunications, Inc., and become the international career coach, author and speaker she is today. Now living her own dream, Kathy is helping others break through their power gaps, find their bravery and seize opportunities for successful, purposeful lives. Before a coaching session, Kathy said that she gives women and men 11 pages of questions to answer on her career path assessment. The first question asks who you are and what makes you special, and Kathy is astounded that women cannot answer that question. She remarks that she couldn’t do it either 30 years ago when she had her own career and life crisis. But she stresses that you must be able to answer that question before you can begin to do what you truly want and live the satisfying fulfilling life on the inside as well as outside. She calls this process “Finding Brave.” She has named her podcast after the process and interviews guests who have found their own bravery to help them work through their own special talents. Kathy said that when you close your power gaps, problems seem to dissolve of their own accord. You find that you will no longer allow that overbearing boss to scare you into obedience or hide your true opinions to keep the peace in difficult situations. You take the credit you deserve, gather support from influential associates and define yourself from a brave present-tense perspective. Dr. Nancy and Kathy share more insights from their mutual training in psychotherapy. Kathy said many of us still carry childhood trauma around with us and allow it to hold us back. Even seemingly supportive parental behavior can steer us in a different path from where we need to go. Listen to more of her personal story, how she discovered her own special talent, and learn more about her book, which is due out in 2020. Check out her website for more about her programs, her blog, speaking, events and personal growth resources, and to access her career path assessment to discover your own talents. 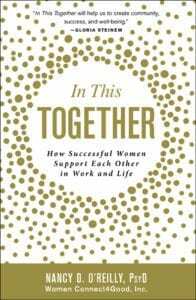 Kathy’s insights also appear in Dr. Nancy’s new book, In This Together: How Successful Women Support Each Other In Work and Life, along with thoughts, inspiration, and stories from 40 successful women across a variety of careers—from authors to actresses, CEOs and professors—encouraging women to support each other in the workplace and in life. Learn about action plans on how all women can work together to break free from the binds of gender inequality. Then remember to get your copy – and gifts for your friends.